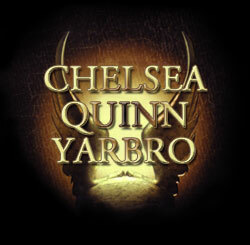 In 1979 Chelsea Quinn Yarbro and her friends began sharing messages channeled from a group entity that called themselves "Michael" through a best-selling book, Messages from Michael. Michael's words were offered without alteration or interpretation for seekers, students, and skeptics alike. Pragmatic, insightful, and often witty, Michael insisted their work was simply to help questioners become more aware and better able to make their own decisions in life. 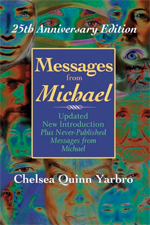 Yarbro followed Messages From Michael, with More Messages From Michael in 1986, Michael's People in 1988, and Michael For the Millennium in 1995. Michael spoke to thousands who found new understandings of themselves. Unfortunately imitators and frauds have since exploited the Michael teachings -- but even they admit that Yarbro's books were the first source of the teachings. 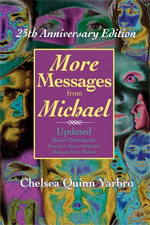 In 2005 Caelum Press published a twenty-fifth anniversary edition of Messages From Michael in hardcover and trade paperback editions. A twenty-fifth anniversary trade paperback edition of More Messages From Michael was published in 2010. You can find out more about these books and the Michael Teachings at the Messages From Michael Web site. The books are available directly from the publisher, and from bookstores online and in your neighborhood.